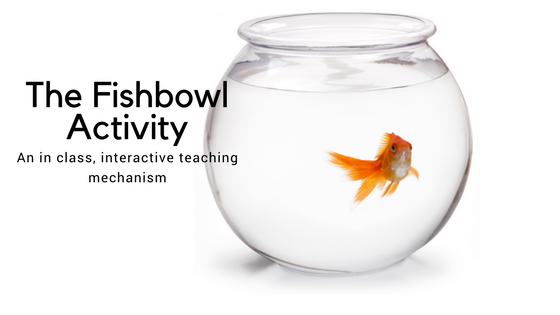 The fishbowl activity is one that can be used with any age group of students in the classroom, but is particularly good for college students to help them stay up to date with all of their material. This activity requires students to complete a short essay prior to class about their assigned homework. In class, the teacher then picks four names out of the fishbowl and those students have to discuss the assignment for up to twenty minutes to the whole class. The rest of the class takes notes and then questions and comments can be shared afterwards. The discussion helps students to really understand what they’re learning and also hear what other students have to say about the topic. Hearing other ideas may also be helpful because not everyone learns or thinks the same way. This technique not only keeps students involved but holds them accountable for what material they are required to know. Students who participated in this activity were asked to do a short reflection and all agreed that they likes the in class technique and wanted to continue doing it because it “keeps them accountable to themselves and their classmates”. The most effective prompts (questions or texts) do not have one right answer or interpretation, but rather allow for multiple perspectives and opinions. A Fishbowl discussion requires a circle of chairs (“the fishbowl”). The other students in the room will be seated in a ring around these chairs. Fishbowl discussions are most effective when students have had a few minutes to prepare ideas and questions in advance. Have half the class sit in the fishbowl for ten to 15 minutes before announcing “Switch,” at which point the listeners enter the fishbowl and the speakers become the audience. Students can also use a “tap” system, where students on the outside of the fishbowl gently tap a student on the inside, indicating that they should switch roles. Afterward, ask students to reflect on how they think the discussion went and what they learned from it. Assign students to two teams. Create a discussion forum for the class. Provide the question or prompt to each team and allow students some time to prepare their thoughts. Provide the rules and expectations for all the “in the bowl” and “out of the bowl” groups. The “in the bowl” students” lead the online discussion forum. The “out of the bowl” students read the posts and evaluate the discussion. Once the discussion period is over – in an online class that may be three days or more, the other students will post their thoughts on the discussion content. The groups can switch or the instructor can debrief the class. Opposing Positions: The goal of this technique is for one group to gain insight about the other perspective by having this opportunity to listen and formulate questions. Multiple Perspectives: These perspectives could represent the viewpoints of different historical figures, characters in a novel, social categories (e.g., young, old, male, female, working-class laborer, industrialist, peasant, noble, soldier, priest), or political/philosophical points of view. The goal of this technique is for students to consider how perspective shapes meaning-making.